As the popularity of Medicare Advantage plans continues to grow, commercial health insurers are starting to look at senior living not only as a partner but as a potential acquisition target. 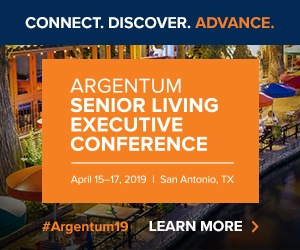 While the number of senior living providers partnering with Medicare Advantage programs is small, the opportunity is significant and will only get bigger, according to Dan Mendelson, president of Washington, D.C.-based consulting firm Avalere Health, a subsidiary of Inovalon. The growth of Medicare Advantage plans, which are managed by commercial insurers such as Humana and UnitedHealthcare, shows no signs of slowing down. At the end of 2017, one in three people with Medicare was enrolled in a Medicare Advantage plan, according to the Kaiser Health Foundation. That equates to 19 million beneficiaries. “Assisted living providers are in a great position to approach these insurers to help manage these customers,” he said. Senior living providers are in a great position to help provide services inside their communities to ensure patients are taking medication, managing diabetes, and ultimately keeping them out of more acute and expensive care settings. It’s a value proposition that Juniper Communities CEO Lynne Katzmann described last year, in light of research showing that Juniper’s Connect4Life integrated care model slashed hospitalization rates and could dramatically reduce costs for Medicare. She believes that based on findings like these, the federal government should allow MA plans more flexibility to cover senior living services. Other providers, including Sunrise Senior Living and Erickson Living, offer some type of partnership with a Medicare Advantage program. Erickson offers its “Erickson Advantage” plan through UnitedHealthcare at 17 of its communities and has more than 4,700 residents enrolled, according to its website. There are few details about Sunrise’s strategy with Medicare Advantage as it was rolled out quietly earlier this year. At the end of the day, there is a symbiotic relationship between the insurers and senior living providers, according to Mendelson. “We’ve even had some health insurers with Medicare Advantage plans start thinking about acquiring into the space,” he said. Late last year, as part of the $4.1 billion acquisition of Kindred, Humana and two private equity companies acquired Kindred’s home health care business, with the insurer havinging the right to acquire the entire operation over time. Analysts from Deutsche Bank said the acquisition provides Humana, one of the largest Medicare Advantage insurers, an opportunity to drive down costs as it can direct seniors to services at home as a more cost efficient option compared to other settings. There is no reason insurers wouldn’t see senior living providers in a similar way, and according to Mendelson and they are already starting to pay attention.